The movement of love in Nigeria’s music industry still lingers as “Manya” crooner Wizkid is set to repay the love demonstrate by Davido at his just held concert, Wizkid The Concert, held at Eko Hotel. Since Davido’s emergence at Wizkid’s concert surprised many music lovers, it has also marked a very famous end to the ill rivalry between Davido & Wizkid. 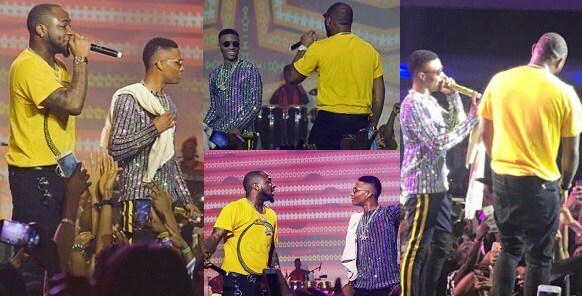 On stage at Wizkid’s concert, the environment was lit as both artistes collaborate to perform Davido’s banger song “FIA”. 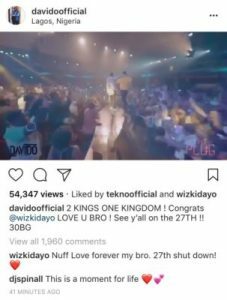 At the end of the event, both artistes have shown love to each other on the internet while Wizkid announced his attendance at Davido’s forthcoming “30 Billion Concert” in Lagos which will held on the 27th December, 2017.